GAZA CITY, Gaza Strip (AP) — In a jarring contrast, Israeli forces shot and killed 57 Palestinians and injured more than 2,700 during mass protests Monday along the Gaza border, while just a few miles away Israel and the U.S. held a festive inauguration ceremony for the new American Embassy in contested Jerusalem. It was by far the deadliest day of cross-border violence since a devastating 2014 war between Israel and Gaza’s Hamas rulers, and further dimmed the already bleak prospects for President Donald Trump’s hoped-for peace plan. Monday’s protests culminated more than a month of weekly demonstrations aimed at breaking a crippling Israeli-Egyptian border blockade. But the U.S. Embassy move, bitterly opposed by the Palestinians, added further fuel. There was barely any mention of the Gaza violence at Monday’s lavish inauguration ceremony for the new embassy, an upgraded consular building located just 50 miles (80 kilometers) away. Israeli Prime Minister Benjamin Netanyahu and other top officials joined an American delegation of Trump administration officials and Republican and evangelical Christian supporters. Jared Kushner, Trump’s son-in-law and chief Mideast adviser, headlined the U.S. delegation with his wife and fellow White House adviser, Ivanka Trump, as well as Treasury Secretary Steven Mnuchin and four Republican senators. Republican super-donor Sheldon Adelson was also present, and evangelical pastors Robert Jeffress and John Hagee delivered blessings. But Monday’s steadily climbing death toll and wall-to-wall condemnation of the embassy move in the Arab world raised new doubts about Trump’s ambitions to broker what he called the “deal of the century.” More than a year after taking office, Trump’s Mideast team has yet to produce a long-promised peace plan. Trump says recognizing Jerusalem as Israel’s capital acknowledges the reality that Israel’s government is located there as well as the ancient Jewish connection to the city. He insists the decision has no impact on future negotiations on the city’s final borders. “What a glorious day. Remember this moment. This is history,” Netanyahu told the inauguration ceremony. “You can only build peace on truth, and the truth is that Jerusalem has been and will always be the capital of the Jewish people, the capital of the Jewish state,” he added. Palestinian President Mahmoud Abbas, furious over the embassy ceremony, said he “will not accept” any peace deal proposed by the Trump administration. The Palestinian president also urged the international community to condemn what he said were “massacres” carried out by Israeli troops in Gaza, and officials said the Palestinians would file a war crimes complaint against Israel in the International Criminal Court over settlement construction. Turkey said it was recalling its ambassador to the United States over the U.S. Embassy move, saying it “disregarded the legitimate rights of the Palestinian people” and would “not serve peace, security and stability in the region.” It also recalled its ambassador to Israel following what it called a “massacre” of Palestinians on the Gaza border. The European Union’s foreign policy chief, Federica Mogherini, called on Israel to respect the “principle of proportionality in the use of force” and show restraint, while also urging Hamas to ensure any protests remain peaceful. U.N. Secretary-General Antonio Guterres issued a similar appeal. Israel says the blockade of Gaza, imposed by Israel and Egypt after Hamas overran the territory in 2007, is needed to prevent Hamas from building up its military capabilities. But it has decimated Gaza’s economy, sending unemployment skyrocketing to over 40 percent and leaving the territory with just a few hours of electricity a day. The Israeli military estimated a turnout of about 40,000 at Monday’s protest, saying it fell short of what Hamas had hoped for. But officials described what they called “unprecedented violence” unseen in previous weeks. Lt. Col. Jonathan Conricus, a military spokesman, said hundreds of protesters carried out “concerted, coordinated” attacks on the border fence. 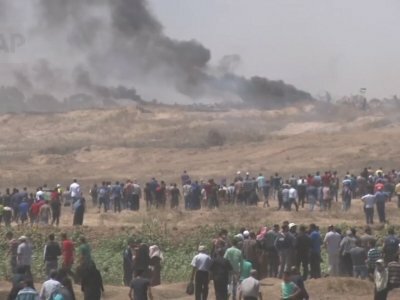 Although the crowd did not manage to break through, he said they caused “significant damage.” The army released video showing demonstrators setting a cargo crossing on fire and appearing to climb on the fence as they lobbed flaming objects into the Israeli side. The new embassy will temporarily operate from an upgraded, existing U.S. consulate building, until a decision is made on a permanent location. Even the current location is sensitive, located partially in an area designated “no-man’s land” in a 1949 armistice agreement. The U.N. considers that land to be occupied territory, though the U.S. says in practice the area has been in continuous Israeli use since 1949. Federman reported from Jerusalem. Associated Press writers Ilan Ben Zion in Mefalsim, Israel, Mohammed Daraghmeh in Ramallah, West Bank, and Karin Laub in Amman, Jordan, contributed to this report.